My husband and I are big smoothie drinkers and eaters, matter of fact, my home blender really gets a workout on most days of the week. When it comes to fruit smoothies, we enjoy them for breakfast, afternoon snack and sometimes as a dessert. I was contacted by J & J Snack Foods and asked if I would like to review their Whole Fruit Smoothie products and I jumped at the chance. I have never purchased premade frozen smoothies before and now I could try them out before I buy. They company sent me a cooler and inside was several containers of Whole Fruit Smoothie which are ready-to-eat smoothies with chunks of real fruit. They are made by J & J Snack Foods and come in 3 delicious flavors! Each of these fruit smoothie cups is only 100 calories which makes them perfect for those who are watching their weight. They come packaged in 4 fl. oz. sized cups which makes them the perfect size to pack in your lunch box or to have as a snack at home. 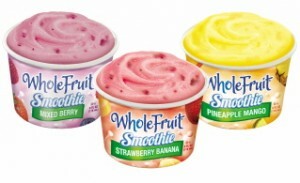 The Whole Fruit Smoothies are smooth, creamy and delicious! You will find chunks of REAL fruit in every bite and they are made with the highest quality ingredients. They are the perfect blend of milk and fruit! You can pop the lid and eat them straight from the cup with a spoon or place them into the microwave for 20 seconds and drink them. How you eat them is totally up to you! We received all 3 flavors in our review pack and let me tell you, they didn’t last long! 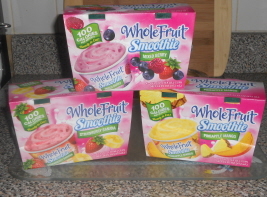 My hubby gobbled down all 4 of the mixed berry ones and I ate the pineapple mango and the strawberry banana ones. All 3 flavors were delicious and had a very nice smooth fruity flavor to them. If I had to pick a favorite, it would be the pineapple mango! 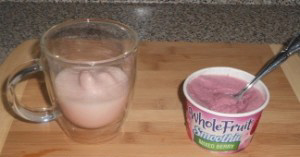 My hubby liked his in a drinkable state, so he did microwave his for 20 seconds. I liked mine really cold and chunky, so I sat them out on the counter for about 10 to 15 minutes and then ate mine with a spoon (like ice cream). Delicious! We loved these Whole Fruit Smoothies and we definitely plan on picking up more! I want to keep them on hand for snacks and for packing in hubby’s lunch box for work. We give this foodie product a huge 2 spoons (thumbs) up! Thanks Whole Fruit Smoothie! I learned they also make a valencia orange sorbet! Only 100 calories per serving! Mixed berry. J&J Snack Foods uses over 450,000 gallons of fruit juice concentrate every year to make our products. I learned they also have frozen fruit bars and the flavor I would like is Pineapple Mango. I entered Dark Shadows on TCC. I entered Keranique on TCC. 1- I learned this: These premium smoothies are all natural, made with chunks of real fruit and only 100 calories per serving! In your grocer's freezer now! And I would love to try Strawberry Banana the most! Thanks for the tasty giveaway! 2- I learned this: These premium smoothies are all natural, made with chunks of real fruit and only 100 calories per serving! In your grocer's freezer now! 3- I learned this: These premium smoothies are all natural, made with chunks of real fruit and only 100 calories per serving! In your grocer's freezer now!